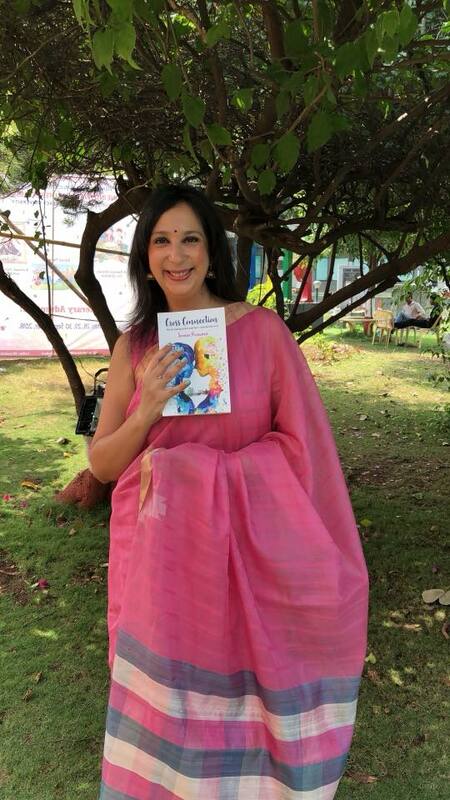 Seema Punwani is a writer, single mum, and marketing professional who learns negotiation skills from her teenage son. She launched her debut novel Cross Connection at the Pune International Literary Festival in September 2018. 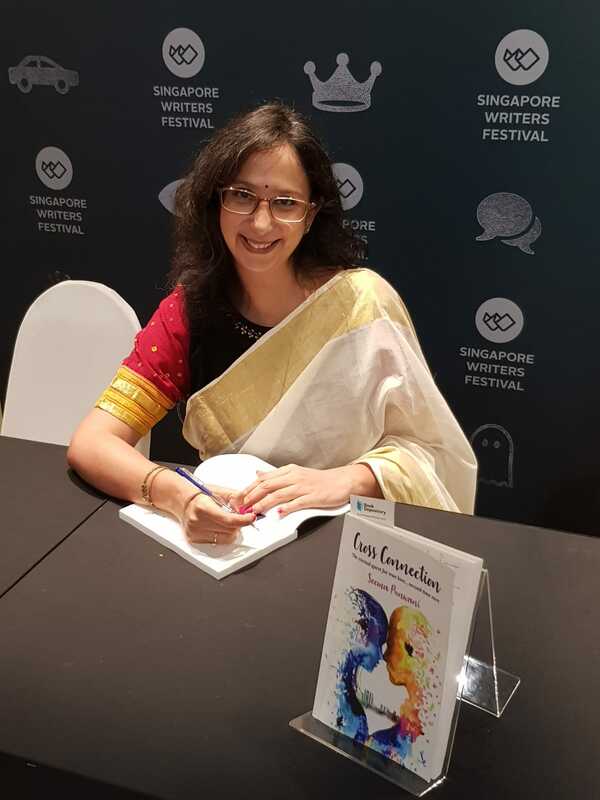 Hailing from India, Seema was born in Spain, grew up in Mumbai and now lives and works in Singapore, pursuing her Masters in Creative Writing part-time at LASALLE College of the Arts. Cross Connection is a modern-day romance about the eternal quest for true love—the second time over. I had the pleasure of listening to Seema read several excerpts from this very funny novel at the Singapore Writers Festival (SWF) as well as the Australasian Association of Writing Programs Annual Conference 2018 in Perth, and spoke with her to find out more about what makes her tick, her favourite SWF experience, and how Singapore has shaped her writing. To start with, we’ve read the official synopsis of Cross Connection, but I’d love to hear from you directly. In your own words—elevator pitch the novel to someone who doesn’t know anything about it. You have two sentences tops… go! Cross Connection is about second chances, at love and in life. The same story is told from two different points of view—the female protagonist Sama and the male protagonist Zehn. Imagine you had the chance for the novel to be placed in between the works of any two authors in a bookstore. Which two would you pick, and why? I love this question! I would like for Cross Connection to be placed between Eleanor & Park by Rainbow Rowell and The Red Notebook by Antoine Laurain. Both books appear to be a boy-meets-girl kind of romance, but the story runs a lot deeper. The narrative covers various social issues and it’s not your average love story. Cross Connection has its share of sweet emotions and funny dating stories, but it also deals with real-life issues like divorce and depression, and is not the fairytale romance one may imagine. One of my favourite things to hear from other writers is what they love best about their own work. We often spend a lot of time being our own worst critics, the chance to reflect positively on our writing doesn’t come often—so please pick a line or two (or a scene) from Cross Connection that you love, and tell us why. What I love the best about Cross Connection, which was also the toughest part to write, is the two different points of view. A woman’s version is seldom the same as a man’s. She looks for the subtexts of emotions (while decoding emoticons) and he is interested in the facts as they stand. I like how the exact same scene is presented in two unique voices. My favourite chapter is “500 days of summer” where, when you read Sama’s portion first, you cannot fathom why Zehn would behave the way he did. Only when you reach his side of the story are his motivations and frustrations made clear. What about a scene that was challenging, and why? The chapter “Down in the dumps” towards the end of the book reveals Zehn’s state of mind and provides a peak into his turmoil. This chapter was challenging to write as I had to make Zehn’s disturbed state apparent, yet have the reader feel sympathy for him. How do you think your writing has evolved since you first started working on Cross Connection? Cross Connection was written over four years ago with several adaptations and re-writes. Then it took me two years to get published. First-time writers, hang in there! Being my first book, I wrote it in a vacuum without any guidance. It was more ‘free flow’. Now I have added structure to my writing. I use tools and techniques like story grids and mind maps to plot out the story, before I begin the actual writing. My writing process has got more structured now, and no, it does not hamper creativity. In fact, structure gives me more ideas to fundamentally revise the plot to make the story come alive for my reader. Do you feel living in Singapore has shaped your writing? Cross Connection is based in Mumbai and Singapore, and both are homes to me in different ways. One thing about Singapore is that extremely friendly towards working women. With the security and convenience this country offers, it is easier for women to balance work, home and passion projects. My next book is my ode to Singapore. You were working on your novel for a while before taking up the MA in Creative Writing at LASALLE. What made you take that decision? Did it change the way you approached your writing? I have never had any formal training in writing, and neither have I ever been a Lit student. After completing Cross Connection and reading several books on writing (one of my favourites is This is the Story of a Happy Marriage by Ann Patchett), I realised I have a lot to learn when it comes to the craft of writing. In order to hone my skills and become a better writer, I decided to sign up for the MA programme at LASALLE. I Iike structure and the programme has helped add rigour to my writing. Of course, the balancing act is now tougher. In addition to providing strategic counsel to marketers and grappling with issues of raising a teenager, I now have the pressure to write grade-worthy essays too. Congratulations on making your Singapore Writers' Festival debut last year! As a long-time festival-goer, do you have a favourite memory or panel from your years of attending SWF? Rishi Bhudrani’s workshop on writing humour last year was fantastic. The practical exercises in his workshop were stimulating and provided good insights on comic timing in writing. I also enjoyed the migrant workers’ short story competition, where the winners recited their 500-word stories. For all of them, English is not their first language but they all managed to write beautiful, thought-provoking stories. I have been attending SWF for more than a decade now. It’s usually around the time of my birthday. Luckily my family knows they cannot fight the nerd in me and lets me celebrate my birthday just the way I love—amongst books, writers and inspiration. Can you give us a sneak peek of what your next novel is about? As of 2018, I have now lived in Singapore longer than in India. It felt like a significant milestone to me when I realised that. I consider myself a ‘local-expat’, writing from an outsider-in view of the island-state. I have lived in Singapore since 1999 and have watched the country transform rapidly. My next book is how I see Singapore and its multicultural essence, which is unique and cannot be experienced in many other countries. The story is about a group of friends who are not from Singapore but have made it their home.